01.25.2008 - Pigeons are opportunistic animals. Like any animal, they need shelter, and the females seek out a safe place in which to raise young. 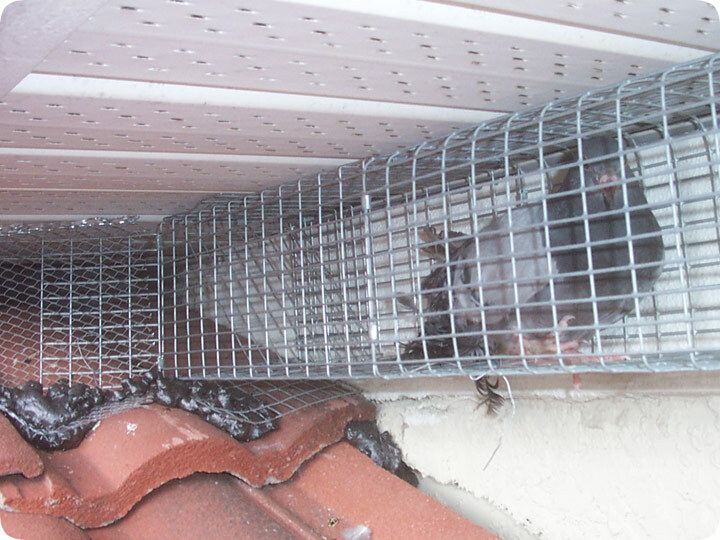 Just as is the case with raccoons, squirrels, rats, and other animals, pigeons have found that the attics of homes make an ideal place to live - they're safe from the weather, dry, warm, and safe from predators. Thus, pigeons love to live in the attics of homes when possible. They need a certain amount of room in order to enter and exit. In this case, it's a classic scenario. This house has a barrel tile roof, and one of the eaves, with a flat bottom, does not sit flush on the roof. In fact, there's a downright huge gap leading right into the attic. Perfect for a pigeon to enter! I was called out to the home because of all the noise the pigeons were making up in the attic. Normally what I do is set exclusion devices - either special netting or modified one-way doors that pigeons can use to exit the building, but not re-enter. In this case, I used a one-way door with an attached trap, so that I could trap the pigeons, which is what the homeowner wanted, since the birds were roosting on the roof as well, and creating a mess. Thus, I trapped and removed 8 adult pigeons from this attic, and removed two nests with young from inside. This photo is of one of the birds in a pigeon trap. This trap is not sold in stores or marketed under the name of pigeon trap, but it's a modified one-way door with an attached cage that I created. I modified it by removing the torsion spring that normally holds the door shut. Pigeons are rather bold birds, and they actually push and shove in order to gain access to areas they want to roost in. Thus, this kind of door works just fine, because when the pigeon wants to get out, it simply pushes its way through the door. However, it lacks any ability to open it back up again. Many pigeon traps are engineered around this principle of one-way doors that pigeons push open and enter, but can't get back out of. I usually prefer a standard exclusion procedure to get pigeons out of an attic, but sometimes a pigeon trap is the way to go. If you want to know other ways to get pigeons out of a house, browse this site. Methods include physical removal, and even the use of leaf-blowers in the attic to scare them out! But usually, a good exclusion device is the best way.